The freshness of the new school year has faded. We go to bed bone-weary, frustrated, wondering if we’re doing everything all wrong. We wake up tired, put one foot in front of the other, and dread the task of getting everyone moving in the morning. This, my friends, is the beginning of burnout. We can’t ignore the warning signs. We can’t push through it. 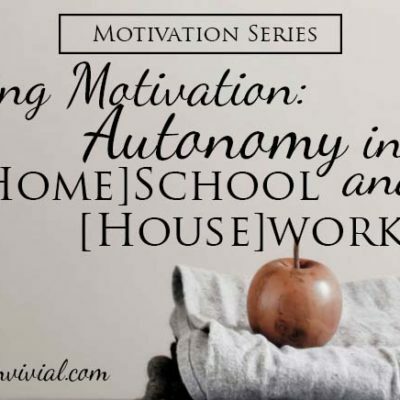 We can’t homeschool well in burnout mode. At a homeschool retreat I went to this summer, the speaker, Catherine Levison, who has graduated all five of her children from her homeschool, told us that homeschool burnout is real and it is a problem we must fight. It is so much better, she admonished us, to avoid burnout than to recover from it. 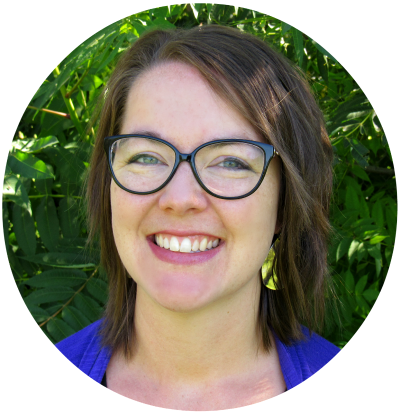 In Teaching from Rest, Sarah Mackenzie mentions several strategies for building peace and joy into a homeschool. 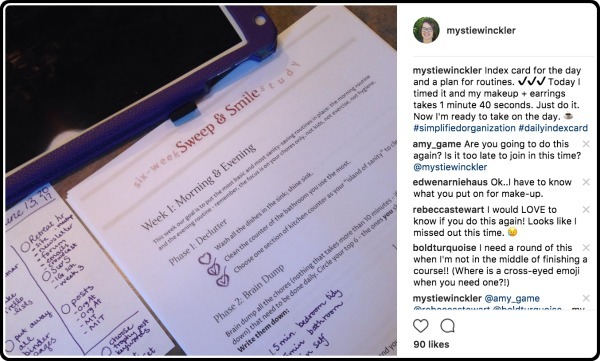 One of the strategies she mentions is the sabbath model school calendar: Six weeks of school is followed by one week of break. One way to rearrange the schedule is to take advantage of the creative freedom you have regarding your calendar. For example, a year-round school schedule with frequent breaks may be a wonderful fit for your family dynamic. I know many homeschoolers who teach for six weeks, followed by a full week off. This breaks the school year into manageable terms, and lets both teachers and students commit to their work for a time without ever going so long that they get completely burned out. 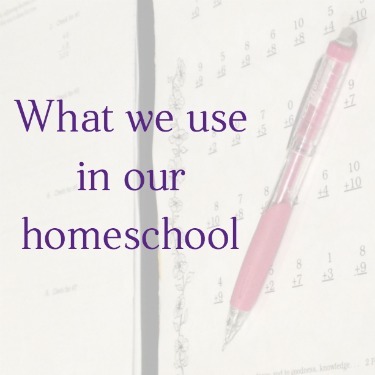 We have followed this year round homeschooling pattern for our entire homeschooling career (8 years and counting) and I hope we can continue it for as long as we do homeschool. It is a life line for me and I also believe it helps the children as well. I have called it Year Round Homeschooling in the past, but found that name confused people. We don’t do school every month, all year, without respite, which “year-round” seems to imply. We do take a long Christmas break and we do take at least a whole month off in the summer. However, we begin our school year in July so that we might have a week off in October and February, plus more. Those strategic breaks are a life saver for the mom – and even for the kids! – who feel like the hamster wheel never stops. Whether you call it sabbath model, sabbath homeschooling, year round homeschooling, interval training, or just life, I highly recommend considering this method for arranging your year. 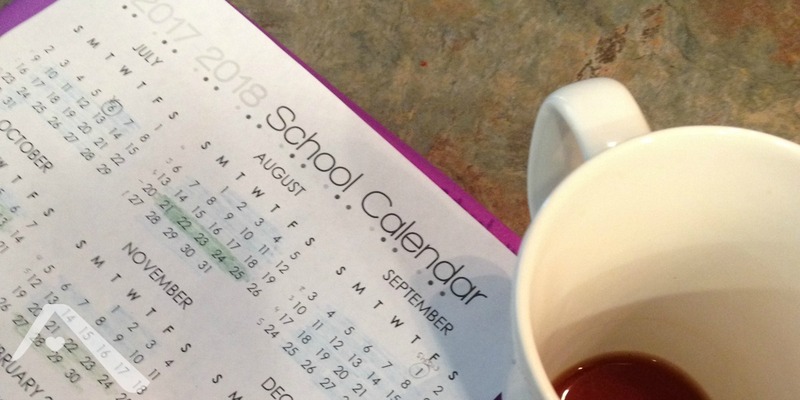 We can homeschool from rest when we build rest into the rhythm of our homeschool calendar. I don’t care much for the name “sabbath schooling.” It sounds like Sunday School, which totally unrelated. We aren’t homeschooling on the sabbath. However, we do take the pattern of 6-then-1 that God modeled in creation and apply it to our school year calendar. It is a proportion of labor and rest with precedent. I’ve also called it Year Round Homeschooling. When we begin our year in July, not long after most schools have just let out, everyone seems to assume we are simply always doing school, like real hard-core troopers. However, we take Thanksgiving through New Year mostly off and we finish up in May. So while others are still climbing onto the school bus, we have the parks and the stores to ourselves. We are definitely not doing school work every week of the year! No way. Rather, we school according to a different pattern: 6ish weeks of work, followed by a week off. To make it work between holidays or planned vacations, we’ve done anywhere from 5 week to 8 week terms, but 6 weeks does seem to be the optimal length of time – long enough to make definite progress and yet short enough to not feel like we’re in a never-ending hamster wheel. One reason why February is so brutal for homeschool moms, I believe, is that we begin back up with school in January right after Christmas. Supposedly this was a vacation, but in reality it was a hurly-burly of work, busyness, and expectations. December is a time of activity and variety, fraught with stress and extra work for mothers, the ones doing the baking, planning, gift-buying, and general holiday-making. After the whirl and blur, we crash into gray hum-drum school days. Then comes 6-8 weeks straight of mundane routine, with many more weeks to go until Spring Break. We want to throw in the towel on all our responsibilities. We are just plain tired. At that point, a week off school is exactly what is needed. The 6-week-term school calendar acknowledges that, plans for it, and orders it. This school plan is arranged to provide for mental health days weeks – and they are good not only for the teacher, but for the students, also. More than once in our house a child has struggled with a concept, full of tears and frustration, but after a break week they return to that concept and it’s clicked. They’ve let go of the anger and stress, and when they return, they are fresh enough to realize it wasn’t as hard as they’d been making it. The same thing happens for mom. When the homeschool days get to be overwhelming and overpowering, a week off – a week in which to catch up on the housework, to get those errands done, to go for walks and to the park, to have fun family days, to do things because we want to and not because we have to – does much to reset attitudes. That’s how we prevent burnout. f you are burnt out because you are tired, then take a week or two off of schooling! Sleep, rest, and do some fun stuff with your kids. Get the laundry and the cleaning caught up. It’s amazing how strongly clutter, and those nagging unfinished jobs in back of our minds, can sap our energy. 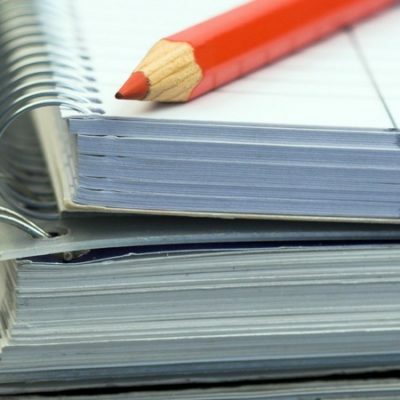 Make a dent in the stack of papers needing grading and filing. Taking some time off will not hurt the kids. The only consequence is that you will finish school a week or two later than you planned in the summer. So, if I don’t follow the public school year, what do I do? And what does this have to do with the Sabbath? 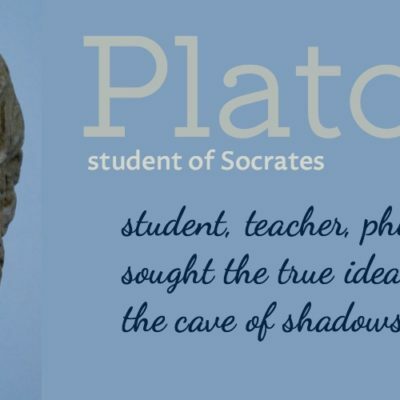 I believe that the Sabbath teaches three important principles for the homeschool. 1) We are free; therefore we can rest. 2) We need regular, scheduled periods of rest. 3) My soul responds to the pattern of laboring for 6 and resting for 1. Here’s why I don’t think that’s a good idea. If I allowed myself to take a break whenever I thought I needed it, I’d homeschool about every other week. Maybe that’s not you, though. Other personality types will be more likely to keep pushing, long past the time they should have been resting. Why take a break week when you can make more progress in the books instead? I’ll tell you why: that break week is time for the information to percolate, time to just be a family and spend low-key time together, time for growth to happen. You know muscles need a break to recover and grow after exercise, right? School is exercise and a break week is time to recover and grow. We need to put those breaks on the calendar to give our kids hope. We also need to put it on the calendar so it is not a matter of negotiation. What we don’t want is the children to discover they can get out of school by wearing mom down with whining and resistance. With a break on the calendar, we can all push through when we’d rather not. We can take a break before we break down. We can take a break without guilt or shame or doubt. We can be confident about what we’re doing, whether it’s school or other projects, because it’s all been determined beforehand. With a six-week term we have a sprint. It is long enough to make progress, and short enough that the end is in sight even from the beginning. There is no long tunnel with a tiny speck of light at the end. Instead, there’s a finite track, and we know we can make it to the end. I have my projects I want to do. I have my other responsibilities that need a little extra attention. The children have their own projects they want to do. They want to exercise their independence and freedom and have more say over their day. We both know there is a time for that, but school weeks are not those times. We can look forward to having a week with longer stretches of prime time to do what we want to do, while zeroing in on what’s currently in front of us right now. “This isn’t forever,” a 6-week term promises. And we all appreciate that promise, that ray of hope. 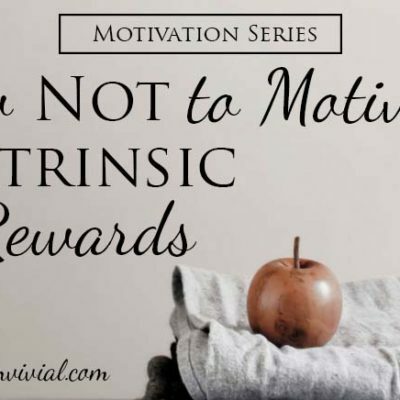 I believe that sometimes the discouragement and resistance our kids sink into comes from the feeling that they have no power over their day and that this daily monotony will be unending. They see no end to it, so they zone out and shut down. With a year round schedule we can show them a calendar and say, “These are school weeks. We will do our work and do it well. This is a break week. What would you like to do on our next break week?” They will respond to that encouragement, and so will we. Break weeks are not all binge-reading & cocktails. Sorry. Break weeks are a break in the routine, they are a school break, but they are not pure vacation and time off. After all, a mother’s work is never done. However, a change is as good as a rest. It’s a proverbial English saying for a reason. Changing things up for a week, spending longer chunks of time working on needed projects, getting the house back under control, running those errands that were nagging you, and, yes, reading a really good book, are all things for break weeks. When I really want to take the day off to catch up on laundry (a sure sign something is wrong), or when a book really calls my name and I know I’ll ignore life for 34 hours if I pick it up, I can stop and say, “Can I wait for break week?” — Delayed gratification is good for us, you know. And you can model it for your kids while you’re also asking it of them. Yeah, makes you look forward to life, doesn’t it? The great thing about a break week, though, is you can require some extra work in the morning – like clearing out from under beds – in exchange for an afternoon of something fun they can’t usually do – watch a movie, play computer, have friends over, pull out paint, turn on the hose in the dirt pile. Always negotiate. My kids now know and expect that at least one day in the week I will be asking extra work out of them, but it still balances out to a more relaxed and laid back week. In fact, because we don’t have school, it’s as if that invisible time pressure eases and even extra work doesn’t have that crunch or stress backdrop. We aren’t stealing time in order to address another area. We can spend a longer chunk of time on something without cracking the whip and making the most of every moment. Even if it’s cleaning out from under the bed, that’s freeing. That’s a break. The story we tell ourselves matters. So, how do we break up the year into six week terms with a break week between? It sounds like it might be tricky, and sometimes we have to fudge on our term lengths to fit them around life, but it’s really not complicated. I begin by marking Thanksgiving Week as a break week. Then I count back six weeks for a term before the holidays. Mark a break week before the beginning of harvest term, then count back six weeks from there. Typically this has us beginning our school year in early to mid July. With our school calendar, these terms are the first half of our year. If you are homeschooling January-November, these are the last terms of your year. Next, start on the first Monday of January. Count six weeks out. That is your first term of the year. Mark a break week to follow it. The next one is where it gets tricky, because I like to arrange my spring break to coincide with Easter. So I mark where Easter is, count the weeks prior, and adjust in the way that makes the most sense so that a break week does not come mid-term. Sometimes this means taking a 2-week break in February – I like it when that works out! Finally, mark your last six-week sprint. 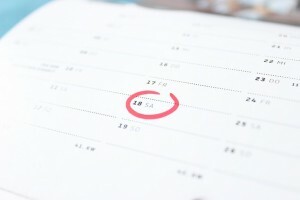 You will likely have all of June off and then some. And did you notice no weeks of December were marked? Sometimes we do only math for December, sometimes we just do other things and don’t sweat it. Our 36 weeks are scheduled and we can have a restful, celebratory December without guilt. Our break weeks are not pure vacation, because we do literally take a day for rest one day out of seven. A break week in a school schedule does not take the place of an actual day off, once a week, to worship and to rest. We can’t save up our rest in that way. This schedule models itself after a 1-in-six pattern, but to do that without honoring the actual 1-in-six pattern God Himself created and commanded will not provide the rest we need. Six days you shall labor and do all your work, but the seventh is a Sabbath to the Lord your God, on it you shall not do any work. God has already set aside one day a week for us to put aside our striving to get ahead, to plan, to clean, to work. Ignoring that while take one week off every six will still leave you tired and frazzled, because it is God’s rest we need first. However, with that weekly rest in place, we can still “labor and do all our work” for six days, even during a break week (with more pauses for pure enjoyment and recreation, also). We can use those six days to catch up, get ahead, and move forward without guilt. Then we can take a day of rest and worship and be ready to plunge into the next term, prepared, rested, and ready. I get a lot of questions about homeschooling for six-week-on, one-week-off, but I also receive emails rejoicing in the new pattern. I want to end by sharing with you some of those comments I’ve received. Last year was our first year with the six week interval cycle, and it was a real blessing for us. I have a bigger age range (13 yrs to 20 mo), but they used that week to spend large blocks of time outside or inside building elaborately with Legos. There were also some substantial kid planned and executed art/craft projects too. They were all really excited that we’d be continuing the interval cycle again this year. I didn’t find that we lost momentum at all, instead we were more able to push forward after the break. If anything, I think we were stronger after the break than before it. We’ve been slowly ramping up our school year, and are now in our sixth week. 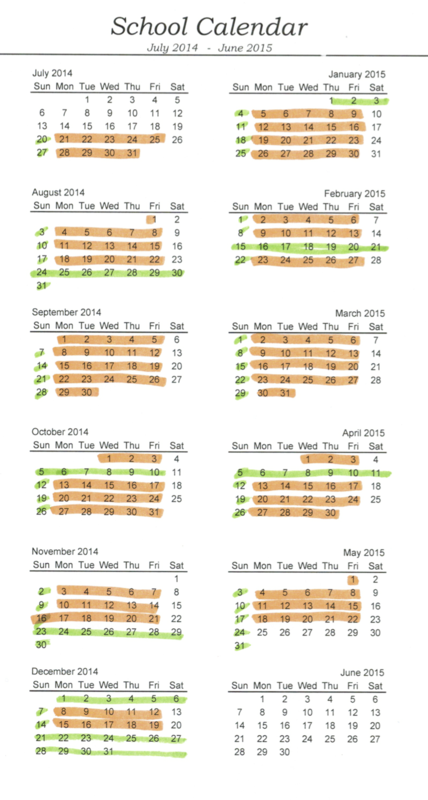 I did intervals for school last year, and found that by week 6 we all really needed a break. Forgetting this when I planned for this year, I thought that our first term would be 8 weeks with the first two being a “soft” opening with minimal subjects. Now I’m reorganizing our interval spacing because I have realized that 6 weeks is really where we need to cut it off. I used your year round term planning method for the first time this year in our homeschool. We are just about to begin our second term, and I love the balanced feeling that term planning has given me. I am just finishing up my first “rest week." To be honest, it didn’t feel much different from previous weeks, but I still feel like I’m trying to implement a good system/process. I spent the week planning out this next interval, as well as revising my intervals for the next year....My kids are all little (oldest is five), so there hasn’t been much change to our daily routine, just a change to my focus during the day. 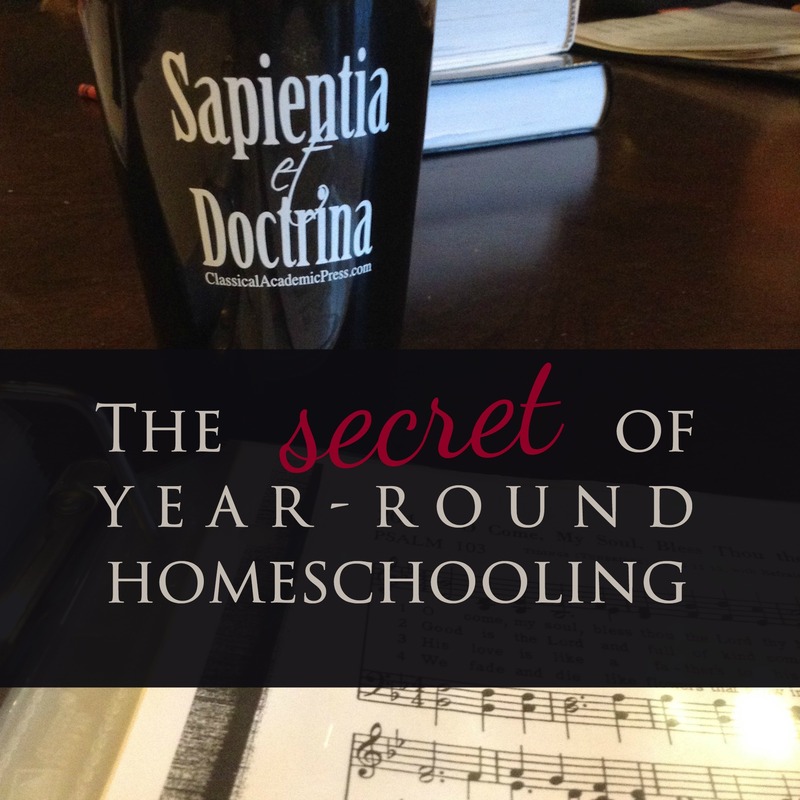 Year-round homeschooling is a rhythm for life that will help us all keep our sanity. 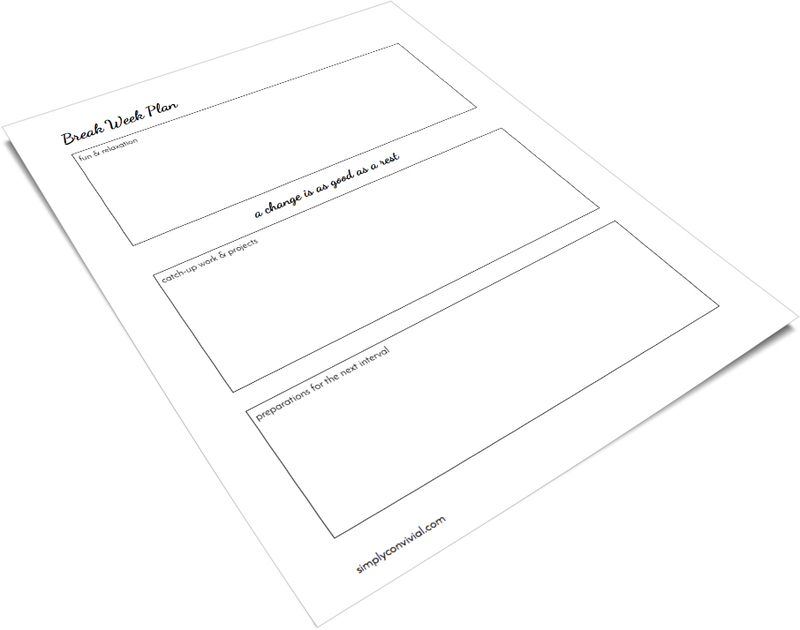 Download the free break week planning page and also receive access to the Break Week FAQ workshop replay. Do you still have questions? Let's talk in the comments! We do the six weeks on and one week off as well, taking Thanksgiving til the end of December off also. We begin the first Monday in June and end as early in April as we can. I felt “out on my own” starting so early but it’s so hot where we live that my little ones spend less and less time outdoors by mid-June. And we get to spend hours and hours outdoor in the Spring when the weather is absolutely gorgeous. It has worked so well for our family, and when that one week off arrives, it always feels like perfect timing. Once in a while I’ve had to school for seven weeks before taking our one week off, and I find I have to have a few more motivating talks to get my children motivated, to keep pressing on. Seems that one week off rejuvenates us all and we rarely hit a place of exhaustion and not wanting to do school. Yes! Adjusting your start and end dates based on when the weather is best is ideal! May and June are generally the perfect outdoor months where we live, so that’s when we take off. Is there a good way to start this right now, even though we are behing on the semester? What would you do? The new year offers a great time to reevaluate and start a new rhythm, even if you’re taking your current plans and adjusting them. You could take Thanksgiving week off as a break week and spend some time looking at what you have planned and 2016 and figure out how to make it work. I also wouldn’t worry too much about being “behind.” You are where you are, and you can only take the next step in front of you. Moving to a schedule where there are planned breaks might be the change everyone needs to return to their work with fresh attitudes. If everyone is tense, irritable, and anxious about school, then I think taking Thanksgiving week & all of December off (maybe do only math fact drill and a short Christmas-themed Morning Time) is a great opportunity to detox attitudes and stress, so you can all return to the work with more focus in January. This type of schooling works best for us. BUT, it is such a struggle to implement. I have a very vocal complainer who is embarrassed to being doing school in July and August when his public school friends are still on break. Your post is pretty awesome and giving me some inspiration to keep fighting for this type of schedule. We are currently in the 6th week of our 6/1 schedule, and 7 work days from our Holiday Break. I can really feel the bit of drag of this last week, the slogging, but it is NOTHING like the high-anxiety dread that I felt before switching to this Interval Scheduling. For the last few years, I thought plowing through was the “character-building” way to go…but there’s nothing God-pleasing about stressed out kids or teacher. Learning just cannot happen effectively in that kind of environment! I’m grateful for the 6/1 method. Seriously saved my sanity. No, REALLY. I’m so glad you posted this. I have been considering a shift toward this schedule, but have wondered how break week would look different. I have 8, 6, 4, and 2 y/o, so we really need routine for there not to be trouble. Because of this, I fear sliding into schooling MORE as a way to keep routine. The weather thing has also been a hang up for me. In MN the summers are golden. We like winter, too, and get outside each day and do snow sports, but a week off in the winter could be brutal weather… or it could be a blast of snow play, depending on the year. I’m trying to think through how to adjust for these things. Thanks for sharing so many details. Really helps to see how someone else successfully does it. Weather does make a difference. I could see flexing a break week to take advantage of weather, especially in MN during the winter! Also, if we call “snow day” or “sprinkler day” or that sort of thing during a school week, we do not make it up. It doesn’t change our break week. I think that’s totally legitimate, too. Letting the kids take advantage of peak weather is one of my homeschool priorities – more so than finishing a book on a certain timetable. You know, I had a floating break week in February or early March for YEARS. This is my first time without one in a long while. The reason is because I had a flock of goats, and I would breed them so that kidding week was timed in late Feb/early March. There was no way to know the exact date, so I would just circle the tentative weeks and then we wouldn’t actually start one until we saw a goat in labor. Thankfully, that usually happened on a weekend and we weren’t finding ourselves trying to break up a week. Anyhow. All of that to say, I wonder if that would work for your winter weather situation? A floating break is definitely an option! We might not get a whole good week, but even if it’s a few days. The weather can shift 30 degrees in a day when a front blows through. I have had some break week “fails” – I had one earlier this year and one or two last year. What I noticed they have in common is that I didn’t get in the “preparation” stuff. If I don’t deal with the piles that have collected during a term, don’t do some extra cleaning (never all the extra cleaning), and a little planning and thinking about priorities for the next term, then I feel like we start back up again without being ready for it and I’m scattered and frazzled still. How about this: Principle 1 – Your break week can’t hold everything you want to do. If you expect to do all the fun things with the kids AND clean the house, then you’re going to be sad. You can’t do fun things with the kids and have a clean house – those are mutually exclusive. :) So we might start off the break week by going to the park or doing something Monday, but Thursday or Friday is cleaning. I find picking a theme for the days of the week helps me focus and not just flit from one thing I could do to another. That list of possible break week activities is a collection of all the things over 7 years that have been on it – not what I try to do every term. Principle 2 – Make sure there’s some significant time set aside during your break week to gather your thoughts and think through the last term and look ahead toward the next. Even if your school planning is done, you need time to review it all, pull it all together, and just wrap your head around it. Some planning time + clearing the piles = a sanity-saving break week. When those don’t happen, I’m just as distracted and frazzled as I was at the end of the term. Another thing I’ve noticed is that if we have a very scheduled weekend or I’m out of town for the weekend, starting back on Monday is not like starting after a break. Having to jump into school mode again after being gone or in go-go-go mode is taxing. I think that Sunday rest as the priority weekly break speaks to that, and if it doesn’t happen, possibly taking Monday off to gather my thoughts and plans and tidy up would be helpful. We did school 4 days a week until two years go, but with 4 students and hitting upper grades, we do school 5 days a week now. However, we’re also mostly done before lunch, except for the two days a week we do lessons in the afternoon with friends. 2yo twins = lots of time off required! Use audiobooks, pare back, take the time you need to to stay sane, and life will settle down eventually. Give yourself a lot of grace at this stage! Interesting! So far I have not planned my break weeks ahead of time…we took one to unpack in our new house, and are taking one this coming week for a birthday + Thanksgiving + household catchup. I was afraid to take a break week during packing etc. because I thought I might need it even more later! Maybe now that I am through the worst of unpacking I can plan more regular breaks. Hi Mystie, Thanks for the interesting post. It is something I have thought about, but was not quite sure how it would fit in with our cold Canadian winters. At the moment we roughly follow the school calendar and take the summer off. After our long, cold dark winters when summer arrives it is hard to keep the kids indoors. But I do wonder, once a 6 week on and 1 week off rhythm has been established if it would not be better than taking a prolonged summer break? Some things to muse over. I am ok with the idea of a break week every 6/7 weeks. It is an idea that I could definitely use and have tried in the past before I got work part time. Where my planning falls down is that my day in day out plans don’t always have much stability to them. I had 4 doctor’s appointments last week. And every week it seems I have 3 or 4 things that are critical to do that week, and they take away from my prep time, my planning time, my rest time as well as our school time. 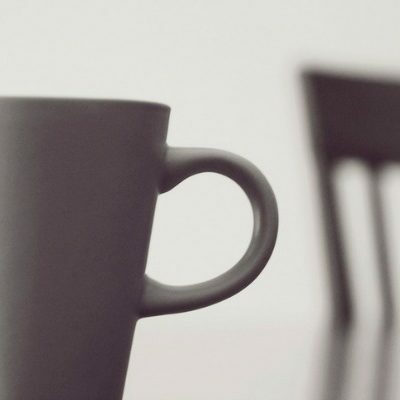 How do you deal with interruptions, days that won’t fit into the “perfect” schedule? I am right down to the wire already with getting enough hours of school done and trying to stay on top of housework while working 3 nights a week until midnight and losing daylight hours making up my sleep. I want to get some of my older children working more independently but my 7 yo needs his mama. I am getting frazzled (part of the reason for causing doctor’s appointments last week) and it is showing in my physical and mental health as I feel really bad that we are not doing school and they are spending way too much time on electronics. 4 doctor appointments in a week happens sometimes, but if big interruptions like that are the rule rather than the exception, or it continues for more than a season or one bad year, then it becomes time to evaluate if you’re able to homeschool or not. It’s real work that takes commitment and energy, and sometimes situations make it not feasible. At least at our home, I find too much screen time means less focus and attention even when they aren’t on screens, and it means more arguments and bickering. Can you perhaps find other things they can do while you sleep? Audiobooks & coloring or Legos? Board games? Chores? :) Make their screen time dependent upon doing something productive and useful to the family. I LOVE the idea of Sabbath schooling, but here is my struggle. I have high schoolers taking outside classes where I don’t control the schedule, our whole family is in homeschool chorus (and I am a director), and I teach 3 weekly classes for elementary children. I AM feeling burned out, but it’s hard to feel free to implement the 6 on,1 off, when you are not completely in control of scheduling. If it were one or two classes that had to be maintained during a break, it would be one thing, but 5-6 outside things that would still need to be prepared for and attended, makes me think it’s just not worth taking a break because it won’t really feel like one anyway. Oh, and I can’t just not do these outside classes. It’s best for my high schoolers to be getting Chemistry and Spanish from Godly women who love these subjects, chorus is a non negotiable, and the elementary classes I teach help pay for the high school classes my kids need. Complicated, I know, but sometimes that’s how life is. Can anyone see any way to unravel this web and make room for rest? Should I just schedule breaks even though it won’t be from everything? While I do love the sabbath schooling calendar, I don’t think it’s a necessity or something you can’t make it through without. With so many outside commitments on a conventional calendar, I don’t think there’s really a way to make it work in the same way. I would simply take advantage of what breaks those classes do afford and not use them for homework or the at-home subjects, but just let them be breaks. You can hunker down and make it through the high school years, making the sacrifices needed to see the thing through. You’re doing good work! I love the 6 and 1 idea! Outside activities are the bug for us too, though. Music lessons, mid-week church, tutorial, scouts, and sports all work on a traditional schedule. Hard to have a real break week when none of those things are off. It works the other way, because if they are off when we are schooling, we just have some free afternoons or evenings. Our activity level is good for us, busy but not crazy with three (sometimes four) days a week with no outside commitments. Mystie or anyone else, can you comment on how to swing the 6/1 terms with similar commitments? Or do you have to drop most outside activities to make it work? 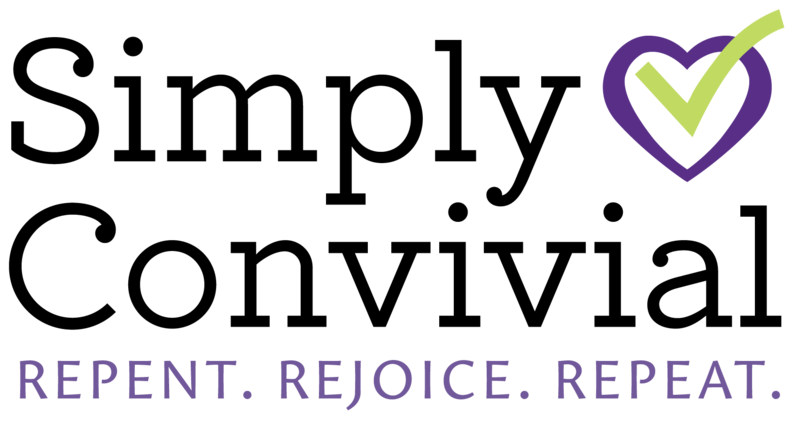 We have piano lessons & a midweek church club that both operate on a traditional schedule. So, even during break weeks the boys still practice piano. However, they enjoy it, so they don’t mind. Just like we still do morning chores, they still practice their piano. And their club is fun and has no homework, so it’s still their enjoyable get-out-of-the-house activity. We aren’t taking out-of-town vacations during break weeks or anything – break week means we can use those school hours for personal projects and hanging out. I don’t find that a few afternoon commitments get in the way. I love this post and how you break down why homeschooling year round is so awesome. I’ve been homeschooling for 3 years now and the year round homeschool schedule saved our homeschool. 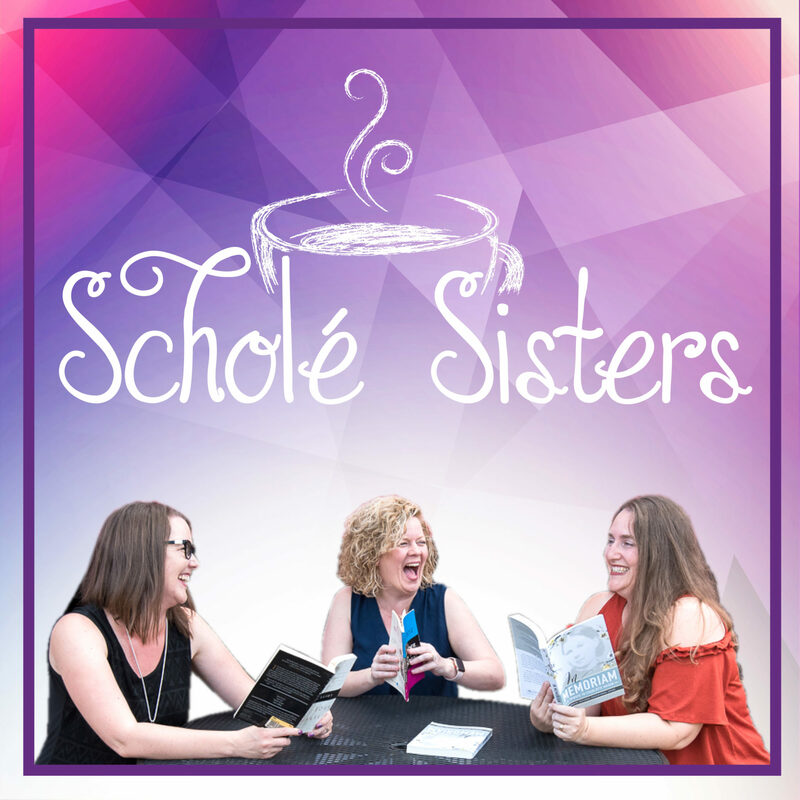 Every year since we started homeschooling we have had things out of our control happen (moving, deployment, death in the family) and being on a year round schedule has allowed us to keep up with work and not feel pressured to grind it out to meet a deadline. We just work and when we are done with that grade level we move to the next and my children can work at a pace that suits out family. We normally work 7-8 weeks on and 1-2 weeks off. It gives us room to take longer breaks whenever we need them and trust me, the need always comes up! I’m so glad this came across my inbox recently. We are still a ways off from really starting a formal year, but I have known for a while that year-round schooling would be the best fit for us. I just didn’t know how I was going to schedule it. This is perfect. Do you have any experience of doing more frequent weeks on/off? It wouldn’t be the norm, or a permanent solution but I’m looking at late spring and summer as a good time for this. For example: 3 weeks off in May, 2 weeks off in June, July and August, with more regular 6 weeks on/1 week off the rest of the year. Any downside to this that you can think of? I have tried schooling as normal in the summer but have struggled with it. Hi Kelly! If you didn’t want to take a longer break in the summer, I think a 3/2 could work. The downside would be a lack of momentum, but the upside would be not having too long spent in chaos and forgetfulness (more than 3 weeks of break isn’t the greatest, I’ve found, but I still do it – sigh). So I decided to see how this would play out for this year even though we aren’t really doing a curriculum. My oldest wants to learn to read and needs to do OT work at home so we are mostly in a “prep” season. Both for him and for me. However, I got to the scheduling around the Easter holiday and their are only 5 weeks between the Easter week and the break in February for 2016. How did you work that out for the upcoming year? Yes, the fluctuating Easter date is always a bother. I just do my best to adjust the terms – sometimes they’re 5, sometimes they’re 7, to account for an Easter break and a February break. It’s hard when Easter is early. Sweet. I just went with a 5 then 7 week term. We are just practicing anyway :) Thanks for the encouragement. My question is how well does this work if you also have co-op/online classes. We are doing 6 weeks on, one off, this year. But my oldest has a few out-of-the-house high school level classes, so she never gets a true break – and I never get a true break from helping her prepare or prepping my own class. True, those weeks are lighter, but there’s always something we have to prepare for. Any thoughts on this? Unfortunately, I think that is just the way it goes once you hit the upper years. That last push means more outside classes, more work, less independence in the schedule. I think the most important thing to do is to keep a one-day-a-week rest day – no homework or prepping on Sundays – so that you can all have one day in seven where school isn’t encroaching. 1. We want to school year round. 2. I would LIKE to take 1 week off every six weeks. 3. I live in the north and love being hot, so I don’t want to be in the house all summer. However, I don’t want to take summers completely off because I feel like my son needs structure. So how much to take off in the summer is what confuses me. 5. I don’t want to take off from Thanksgiving to Christmas. Just a few days from each time frame. I prefer this because , again, my son would become bored. 6. I prefer a 4 day week, but not if it means we aren’t schooling enough. I live in DE and from my understanding they don’t have any restrictions with respect to how many days. 4. Should I just take off completely while my ils are here? Or just get in what I can and leave the rest? Hi Serenity! School for a 5-6, even 7, year old only needs to take 60-90 minutes – though that wouldn’t count your outside lessons. 4 days a week during those years is a great plan, because then you have a free day to get out, to play outside lots, to follow up interests. 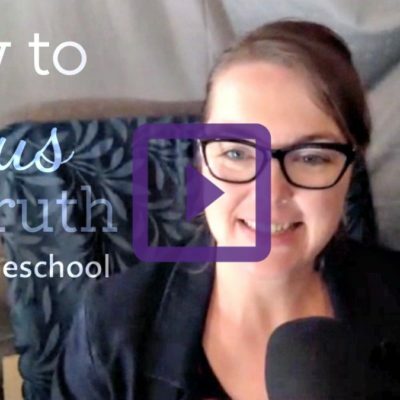 Never discount all the learning that’s happening apart from the planned, structured school. Through age 7, that’s equally as important if not more important. Karate is extracurricular and I wouldn’t even think about it in terms of my school plan. You’re not going to make them follow your school calendar. :) Your tutor also might not be able to flex with your school calendar. But still taking a week off now and then of your regular times together will give you a nice break and some extra time. I am sure there will be so much informal learning happening while your in-laws are visiting that it’ll be fine! That will be special time to spend; it’ll be more important that he connect with his grandparents and spend time with them than that he gets a few more math lessons in while he’s 5. :) You’re not being inconsistent or a cop-out if you take that trip as its own term, a term of learning of a different kind. I actually feel much better after reading your response. He is just 5. And little sis is so much work. Thanks for the insight! * we definitely want to teach him how to swim. Probably in July. Forgot to mention. I also have a one year old little jumping bean that gets in our way during schooling. She’ll be 2 in July. I’m not interested in formally schooling her. Just thought I’d throw that detail in. I am probably going to put together special items for her that are only pulled out during schooling time. So she can leave us alone! I’ve only recently realized other people do year-round/interval schooling even though we’ve been at it for a few years. We stuck to the public school schedule our first year of homeschooling and both my daughter and I were so burned out (yes, KINDERGARTEN burned us out! lol) I thought I was incapable of homeschooling. We switched to a year round schedule and it has made such a huge difference. We don’t do 6/1 though, we do 3/1 and actually school all year long. The three weeks of school goes by so fast that we don’t feel burned out at all and I’m not nearly as stressed about all the extra things that need done around the house because I have a whole week every month to dedicate to non-school things. The 3/1 schedule does allot us an extra 4 weeks of vacation to use wherever. I also tend to have 1 week in both the Fall and Spring that I call field trip week (better known as “I refuse to explain math this week” week) and we take field trips every day where we can enjoy the nice weather. 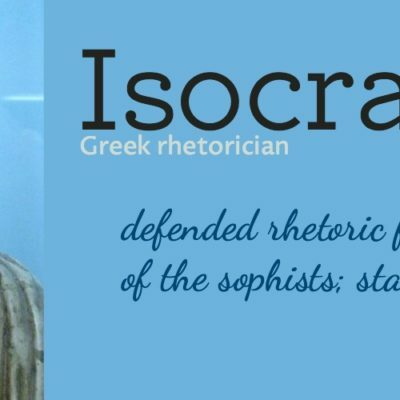 I think I’ve just discovered that for us, the key to homeschooling is to not let ourselves even approach the burned out status. I enjoyed the article! Kami, that’s awesome that you’ve found a rhythm that works for your family! That sounds like a great pattern. I am gearing up to homeschool my soon-to-be second grader..I am very very very excited to school year round. Im my state the requirement is 900hrs. No specific amount of days. I would love to to the 3 weeks on/1 week off. Our family is very relaxed and long term rigorous schedules wear us all out. In doing the 3/1 would I need to school all 5 days or could I manage to school for 4.? I know im a few years late in commenting but I really loved this article!! We finished our winter term yesterday, too! A trip to MacDonald’s was our celebration :) Now I am elbow deep in our school room, sorting through our 6-week long mess…but I have great plans for days of rest ahead! Mystie, I love this post so much I had to share on my Facebook pages and groups! This is exactly how we homeschool and we keep Shabbat too, so it only made sense to do the same in our homeschool and take breaks every 7th week so recharge, reevaluate, and get refreshed. I’m also all about simplifying as much as we can and doing things from a state of rest, not panic, not overwhelm, not exhaustion. And boy I know those states well. I burned out completely 3 years ago ending up in critical care due to stress, so now I see life with different eyes. Now I’m on a mission to prevent other homeschool moms to burn out like I did.